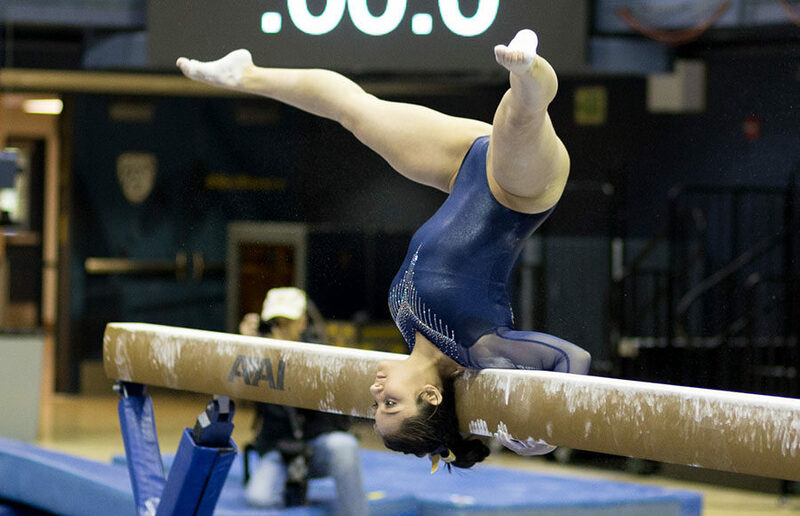 Senior Desiree Palomares’ season came full circle Saturday at NCAA Regionals, winning the beam title and securing her spot at NCAA Championships as an event specialist. Having started the season on a three-meet beam title streak, it comes as no surprise that Palomares will represent the Bears at the NCAA Championships. What does come as something of a surprise, however, is that Palomares will not be bringing the No. 16 Cal women’s gymnastics along with her. The team’s season came to an end this weekend at the Fayetteville Regional, where it finished fifth out of six teams, missing a top-two spot that would have sent them on a return trip to nationals. While it was a disappointing finish, it came on the heels of a program-best regionals score of 196.300. The field of competitors was tough, featuring No. 4 Utah, No. 9 Denver, No. 21 Auburn, Arkansas and Central Michigan. Utah is not only the reigning Pac-12 champion, but it is also now riding a streak of 42 consecutive appearances at NCAA Championships. The other championship qualifier, Denver, was the runner-up at Big 12 Championships and will be making its fourth appearance at nationals. It was big league gymnastics all around. 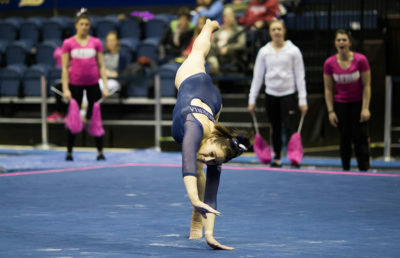 Cal’s first event was floor, where the lineup was consistent through and through. Senior Zoe Draghi led the team with a 9.85, and the Bears racked up a 49.000 total to kick off the meet. Next, it was on to vault, where junior Arianna Robinson and senior Emily Richardson were unsurprisingly one and two for their team, respectively. 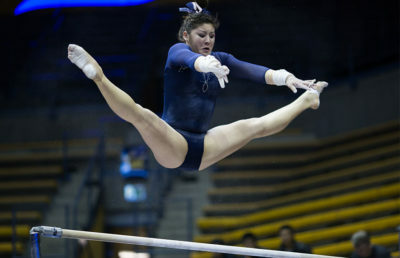 Robinson was recently named an All Pac-12 second team selection for her unique and consistent performance on vault, and Richardson has hit every vault this year. The Bears put together a 48.975 total on the event. The bars event was highlighted by a stellar performance from junior Yuleen Sternberg, whose clean lines afforded her a career-high 9.90. With no score coming in lower than a 9.725, the Bears hit their second-highest bars score of the season, a 49.225. Heading into the final rotation, Cal found itself in last place with a considerable amount of ground to be made up. And on their best event, the balance beam, the Bears delivered. Palomares’ career-high 9.90 was followed by a pair of 9.85’s from sophomores Chelsea Shu and Sofie Seilnacht. The 49.100 rotation was an appropriate, while perhaps undesired, finale to the season. So it was Palomares who ultimately came out on top, sharing her title with Utah’s Shannon McNatt, Denver’s Maddie Karr and Central Michigan’s Katy Clements. Palomares and her co-champions will compete the weekend of April 14 in St. Louis for a shot at the national balance beam title. As for the rest of the Bear gymnasts, they head home with the satisfaction of a solid season and a probable chip on their shoulders for next year’s regionals.